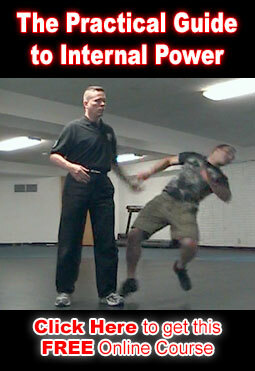 Shock Kicks are a valuable tool in your arsenal and are one of the basic kicks in Clear’s Silat. The shock kick is intended to be a surprise leg attack at just the outside edge of punching range. The shock kick has whole body power behind it and is quite powerful. Learn to use shock kicks. The basic method for throwing a shock kick is to shift or rock forward moving the rear foot into the position of your front foot and let your front foot travel to the opponent / target. While executing a shock kick the knees normally stay at least a little bent. You do not want to put the whole body weight transfer of power through locked or rigid knees as over time this could result in a lot of knee trauma and damage. When the rear foot sets down it is with the whole body weight dropping into the floor. The resulting shock is transferred into the movement and impact with the front foot. Done properly a shock kick does not look like it is nearly as powerful as it actually is because the force is hidden by the drop and shifting body action. Another way to throw the shock kick is to pick up one of the feet and drop it straight down with your relaxed body weight landing on the floor. The other leg is allowed to perform the kick as a result of the instant rebound of the dropped body weight transferring back up and through the body. Again, the knees are at least a little bent. Last but not least the shock kick can be executed and enhanced by performing a body wave to get the shift from the back foot to the front and letting the shifting action cause the back foot to replace the front and allowing the front foot to shoot out in front of you. This is the most powerful way to perform the kick but it is the slowest way to do it until you have practiced the body wave enough that it is practically invisible. 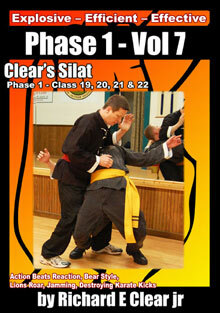 Clear’s Silat will utilize this kick with material in our more advanced phases so it is recommended that you practice this kick until you can do it easily and make it your own that you can perform at will whenever desired. In application this kick can be used to stop an incoming attacker and instantly cause them to pitch forward into your hand and elbow attack. It is also a kick that can quite easily shatter the opponents knee. Good training to you and please be careful when learning and practicing the shock kick.